I grew up in a church that taught that the way to spend eternity with Jesus was by keeping His commandments. By the time I was 23 I had just about given up on God because I was constantly failing. I decided to join the Peace Corps. Perhaps serving God and man this way would ease the aching in my heart for peace. I was sent to Chad (in Africa) and there for the first time heard that the Bible teaches heaven is a free gift. This gift comes because all my sin was paid for on the Cross. When Jesus cried, “It is finished” that is what He meant. I wanted to tell everyone this wonderful good news. I started by writing all my friends in the U.S. even a young lawyer whom I had dated (who later became my husband). He was the only one, at the time, who was interested in this wondrous truth. God wonderfully brought new life to him about a year later and we both wanted to study the Bible and serve God wherever He would place us. I am sure that every missionary believes that they have the best job in the world. I know I do. My particular field is “the world” in that we are ministering to International Students from around the globe. We have the opportunity to be their friends and help them navigate this new culture and the loneliness that comes being far from home. God had prepared my husband and me for this even before we became Christians because we had both served in the Peace Corps (at different times) and knew what it meant to be a stranger in another country. College students are at a stage in life when they are asking the big questions: what is the purpose of my life, why am I here, where am I going etc. The International student is somewhat different than an American student in the way he/she processes these questions. However, the questions can be stepping stones to finding the God who loves them and has a purpose for their lives. People ask how we meet students. One answer is that we meet them through other students. We offer English conversation though this is not as important as it once was because their level of English has vastly improved in the last few years. However, there are always some who need help in this area. We meet them through activities: picnics, our Saturday night meeting where we serve dinner and then have a Bible study. We have them over for dinner and games. You are only limited by your imagination. In recent years we find that students really want American friends their own age. Our church family and the Bible College “down the road” have been a good resource. The most important quality you can have for this ministry is a love for young people. Love finds a way to connect. The missionary who led me to Christ while I was in Africa taught me that concept. He learned it from his Savior. I think you need a humble attitude about your own culture too. We can learn from others and should. What are some of the struggles we face? I learned early that it is important as I stand before God, that I teach the Bible, not traditions, not my culture, and not my preferences. I think the hardest thing is when you see someone walk away from the truth. However, we serve the God of all comfort. He has blessed us with so much and I am grateful that He will never leave us or forsake us. Circumstances do not give us hope. But the promises of God do! And when we are just trusting them, we are already giving glory to God, which should be enough for us. I am grateful that the gospel that I heard in Africa is still the “power of God unto salvation.” We have a message that can give hope in any situation. Let’s share it! I’ve been working with Campus Bible Fellowship of Iowa since 1976. This ministry reaches students when they are open to new ideas and learning to think for themselves. Internationals are more than willing to learn about the Bible and Christianity. These students are forming their own beliefs away from home and peer pressure. It is a terrific mission field where the people come from around the world to our doors. Seeing students saved, growing in the Lord and often later becoming active in their churches (some even coming back into CBFI as staff). Children of former CBF’ers attend CBF and become a big help to the group. And since working with international students, I really like Revelation 5:9. People will be singing praises from all nations. We have a part in that. Literature Tables + Atheist Club = Blessings! College campus ministry is one of the greatest mission fields in the world! We are thankful for the opportunity to reach out to both International and American college students! One of the reasons campus ministry is so strategic is because college students, who have learned our language and our culture, come from all over the world to our college campuses, therefore we are able to share Christ with students from all over the world, right here in the United States! Many of these students have never before had opportunity to hear that Jesus loves them so much, that He suffered and died on the cross for their sins and then rose again, and that if they personally believe in Jesus, then they can receive the free gift of eternal life! After students come to know Christ personally here in the United States, and after we disciple them, they return to their home countries where they can share the Gospel with their families and friends. Atheists, Agnostics, Pantheists, Pluralists, etc., come up to discuss the question of the day that we have displayed at our literature table. This gives us great opportunities to share the Gospel! Also, the atheists who come up to talk to us at our table invite my husband to come to their Atheist Club so they can ask him questions and hear what he has to say about various topics. We are thankful for the many friendships that we’ve been able to build with atheists! We are able to build friendships with students at our Friday night activities (such as Welcome Back to School Dinners, Fall Festival Parties, Thanksgiving Dinners, Christmas Parties, Valentine Parties, Chinese Culture Nights, Hot Topic Discussion Nights, etc.). We also build friendships by having students into our home for meals, by taking the students hiking, to museums, to the zoo, and to other fun events. One of the main goals we have is to get students to the local church! Therefore, we pick up students for church; I also coordinate the students to sing together for specials at church, and I accompany the college students who sing or play their instruments at church. 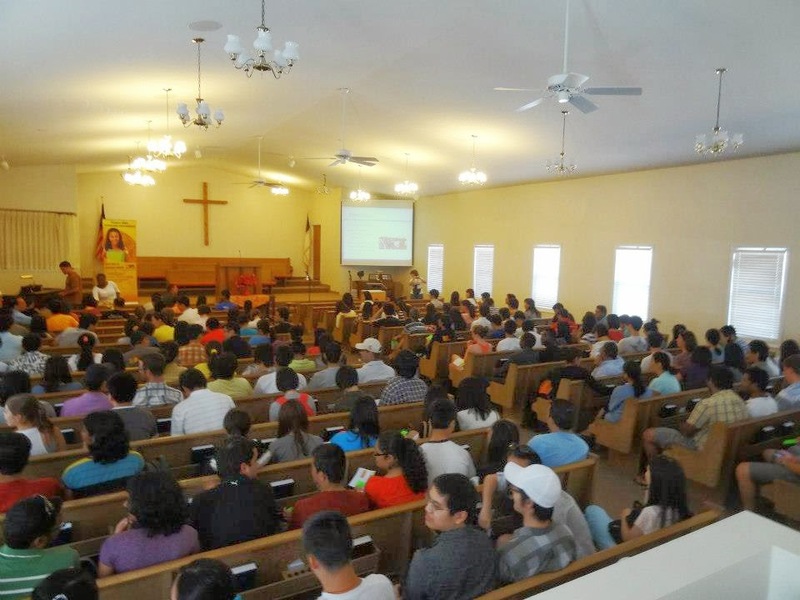 Some of the students even help with other ministries of the church such as Children’s Church, the High School youth group, and help run the church sound system. As far as a specific passage of Scripture that I especially treasure in regard to our college ministry: We are constantly asking for God’s power to work in lives–for His glory! Also, because we “reason” with students who come up to talk to us at our Lit. table to discuss with us our “Question of the Day,” I am reminded of Paul’s ministry at Athens in Acts 17:16-34. Verse17 says that Paul reasoned in the marketplace daily with those who happened to be there. Then, in verse 34, it says that some joined him and believed. We are thankful to be a part of reaching out to students on our college campuses, the future leaders of the world! Campus Bible Fellowship at the University of Iowa had a lot to do with my getting involved in many aspects of ministry. The most direct influence was in music, while the atmosphere and example set in the CBF group members encouraged me to step up and serve in many other areas of ministry. Nancy Miller, our campus missionary’s wife, encouraged me to begin singing in the music ministry. I had always LOVED to sing, but I only really did it in the car or somewhere else where no one was listening. One day, she set me up with a duet with another student. We sang together at a CBF banquet. While I was terrified, I truly enjoyed it. She then began asking me to participate in more duets, until, finally, she coaxed me into trying a solo. Because of her direct encouragement and putting me to use, I have been a regular part of music (and now getting teenagers out there to sing and play instruments) in the church for more than 20 years now. I think God used Nancy, through CBF, to encourage, train, and equip me for this area that I may never had delved into had I not been involved in CBF. In general, the overall atmosphere and culture in CBF and among the other college students and young people in our church set a tone for my becoming active in local church ministry. I was a brand new Christian and had never seen people serving in the church. Just seeing fellow students step up and hold dorm Bible studies, work in various ministries, invite others to church, etc. was an example I learned to follow. To them being involved in CBF and also the local church was not just for the fun of it; it was for ministering to others. While I was in CBF I began to serve and teach in AWANA and Junior Church in our local church. My husband and I also started a young marrieds Bible Study in our new apartment because of the example put forth in CBF. There were various other ministries we were involved in as a result of the culture set forth in CBF, and we are still actively serving and teaching and hopefully leading by example today. I was saved the school year prior to my coming to college. As a new Christian who had never attended a Christian church, I believe CBF had a huge impact on my life for years to come, showing me that healthy Christians are actively involved in their local churches and looking for ways to both lead others to Christ and to encourage other believers to serve the Lord. Testimony of Salvation and How Great God Is! I grew up in a family of four siblings with a Buddhist background. When I was nine, my parents broke the news to us that my dad was having an affair. Family and friends told us that this was due to karma, and that it was because we had done something bad in our previous life. We were told to accept it, and to do more good things in this current life so that we would reincarnate to have a better life. But I never understood the meaning of going to temple, and why the “gods” I was praying to never answered my prayers – that things around the house never got better, even when I was being a good girl, studying hard, not smoking, not drinking. I didn’t understand the concept of doing good works and being able to reach that state of nirvana. I left home to study college when I was sixteen, and at that point of my life, I was completely detached from any kinds of religion, and was constantly burdened by calls from home, and stress from school. Two years later, I came to the states, and was accepted into Iowa State University. A year later, I find myself struggling even more with studies, and struggling to understand what my purpose was being alive. I felt that I was wasting my parent’s money with my poor grades, and that I was worthless. “For the wages of sin is death, but the free gift of God is eternal life in Christ Jesus our Lord” (ESV). This helped me realized my disobedient to God, and went on to learning about Jesus dying for me, so that He may redeem me, and that through His resurrection, I will earn eternal life with God. “For we are his workmanship, created in Christ Jesus for good works, which God prepared beforehand, that we should walk in them”(ESV). This verse has helped reminded me to constantly walk with God, and to learn to be more like Christ. I am just so blessed to have such a personal God that would change me day by day, and looks forward to everyday spent with Him. Have you considered investing in the lives of college students in your church and community? Perhaps you are already involved in a college ministry. Please feel free to post testimonies and questions below! Thank you for visiting Women On God’s Mission.